Dr.Pulley sliding rolls in the 21x17mm format, weight 15 grams, 6 pieces / package. Dr.Pulley recommends that you choose the weight of the SR role sliding around 10-15% below the weight of the series roll. Then a significant powerful acceleration results in an almost unchanged top speed and fuel consumption. If the weight is chosen equal to the original weight, the acceleration is slightly stronger, but may slightly increase the maximum speed for the same or even slightly reduced consumption. Dr.Pulley sliding roll size 19x17mm, weight 14 grams 6 pieces / package. 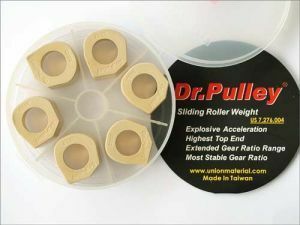 Dr.Pulley sliding roll size 28x20mm, weight 26 grams 8 pieces / package. Dr.Pulley sliding roll size 25x17mm, weight 15 grams 8 pieces / package. 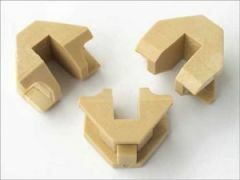 Dr.Pulley sliding role in the 16x13mm format, weight 5,5 grams 6 pieces / package.